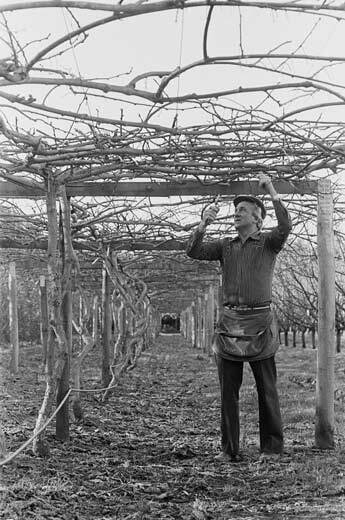 Kiwifruit grower Sid Desborough is pruning one of his pergola-supported vines. Kiwifruit are increasingly grown on pergola frames – although more expensive to build than T-bar structures, they help produce better-quality fruit. Vines form a canopy over the pergola and the fruit hangs down. Steel is beginning to be used in place of timber frames.